The ‘daring’ operation to transplant the ovary involved surgeons connecting blood vessels as thin as a human hair. The groundbreaking surgery is the first such procedure that has resulted in a successful pregnancy and birth. Dr. Sherman Silber, of the Infertility Centre of St Louis, in Missouri, who is a leading expert first in transplant and fertility surgery, carried out the operation in January last year. The operation involved complex and delicate microsurgery taking the right ovary from Dorothee Tilly and transplanting it into the right side of her twin sister Susanne Butscher, now aged 39. Each twin was on the operating table for more than four hours and was left with a small scar on the right side of the pelvis in a procedure known as keyhole surgery. The ovaries, which are the size of walnuts, are hidden deep inside the pelvis. They are fed by tiny blood vessels, a fraction of a millimetre across, each of which had to be clamped off and carefully disconnected from the donor before being reconnected in the recipient. 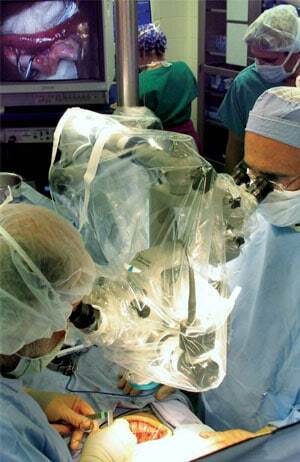 During the operation a slice was removed from the organ to be frozen in case the transplant failed. This tissue could be saved and transplanted later if necessary. Unlike normal transplant patients Susanne does not need to take drugs to stop her body from rejecting the organ because Dorothy is her identical twin sister. Within a few months the transplanted ovary began to produce hormones and Susanne began to have a menstrual cycle, although irregularly at first. Susanne had been menopausal since age 15… Her ovaries had stopped producing hormones and eggs. She was infertile unable to have children until Dr. Silber’s operation, the first of it’s kind. She took artificial hormones in form of hormone replacement therapy and the contraceptive pill but suffered side effects. In the late 1990s a specialist in London diagnosed that she had brittle bones, a condition called osteoporosis, which can be a complication of the menopause due to the lack of oestrogen. A gynaecologist recommended Dr. Sherman Silber after hearing him present research on partial ovary transplants he had carried out which had resulted in women producing their own hormones again and their fertility returning. Because of Susanne’s osteoporosis she wanted a more permanent solution and a whole ovary transplant offered the hope of a normal reproductive lifespan rather than just two or three years of fertility. The technique will also offer hope to young women with cancer and who would otherwise be left infertile by their treatment. They will be able to remove an ovary, freeze it, and then re-implant it once they have been cured of their cancer. “But the ‘overwhelming usage’ will be women who want to preserve their fertility for the future and to delay menopause,” Dr. Silber said. This allows them to have children when they are older and preserve their fertility from the ravages of the biological clock. Dr. Silber is now also planning ovarian transplants on four pairs of non-identical twins. “Rather than widespread transplants between non-relatives, the technique will invariably be used to preserve and restore fertility in cancer patients and for women who wish to delay motherhood and the menopause for social reasons,” he said.